← Your friendly neighbourhood supergiant! I was flicking through the rather marvellous webcomic, Abstruse Goose, recently, when I happened upon this particular comic (click the panel for the full version). Wait, what? 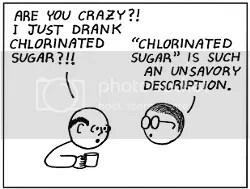 Chlorinated sugar? This piqued my curiosity somewhat, so cat-like as ever*, I decided to investigate further. It turns out that, as they say, many a true word is spoken in jest. Make no mistake. The artificial sweetener sucralose, more popularly known as Splenda®, is precisely that. Chlorinated sugar. It’s also known as 1′,4,6′-Trichlorosucrose, E955 or (deep breath!) 1,6-dichloro-1, 6-dideoxy-β-D-fructofuranosyl-4-chloro-4-deoxy-α-D-galactopyranoside. Containing chlorine atoms covalently bonded to carbon atoms, it’s an organochloride compound (also known as a chlorocarbon). This makes me raise a slightly skeptical eyebrow. Now, I have nothing against chlorine, but the releasing of chlorocarbons into the environment on a large scale? That makes me a bit uneasy. I’ll make no secret of the fact that I detest artificial sweeteners. As opposed to the good old fashioned sugar that our digestive systems have spent hundreds of millions of years evolving to digest efficiently, many people seem to favour fabricated chemicals which apparently taste “sweeter”. As far as I’m concerned, they spoil the taste of things. Since when did “no added sugar” come to mean “icky artificial sweeteners added instead of sugar”? Couldn’t they just – you know – not add any sugar? But enough of my ranting. I have a little more than just personal opinion to go on here. 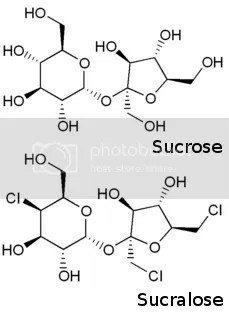 The two molecules to the left are sucrose and sucralose. 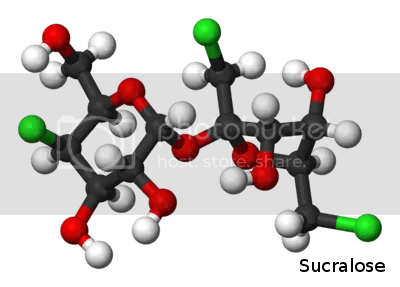 A disaccharide, sucrose is made from one molecule of fructose and one of glucose. It’s the dominant type of sugar in sugar cane and sugar beet. Just plain ordinary table sugar. The same kind found across the world. Sucralose, as the Splenda® people rightly claim, is “made from sugar”. Just chop off a couple of hydroxy groups and swap them with chlorine (which is, admittedly, easier said than chemically reacted). In fairness, it is perhaps the least awful tasting of the artificial sweeteners still available**. In fact it seems to be steadily replacing aspartame, which is arguably a good thing. So what’s the big deal? What’s my problem with chlorinated sugar? The trouble with organochlorides is that, while not necessarily toxic, they’re notoriously stable. A good example would be a certain famous chlorocarbon. Now let me make it quite clear — I’m not comparing sucralose to DDT. They’re very different chemicals, with different uses, reactivities, stabilities and so forth. The point to this paragraph is more to highlight precisely how stable large chlorocarbons can be, with DDT being a prominent example. DDT was used widely as a pesticide during 1940s and 1950s, due to it being extremely toxic to invertebrates, but “safe” to vertebrates like people. Except that it isn’t as safe as was once thought. Actually, it’s been linked to diabetes, asthma, neurological problems and birth abnormalities, as well as being a suspected carcinogen. The trouble was that DDT was stupidly stable. It just didn’t break down. As a result, it accumulated in the world’s ecosystems, ravaging coastal invertebrate wildlife and steadily building up in the tissues of predatory animals. Disturbingly, DDT was still found in human blood samples as recently as 2005 and is regularly found in food samples tested by the FDA. Sucralose is similarly stable (albeit less so), and when it does break down, it doesn’t break into anything harmful. No other sweetener holds the accolade of being considered “safe” by the Center for Science in the Public Interest. The trouble is that it’s low calorie because it isn’t really absorbed by the human body. Most will pass straight through you, with only around 4 – 12% actually being metabolised. Indeed, the Swedish Environmental Protection Agency has cautioned about potential rising levels of the stuff in wastewater. Water treatment plants were shown to have little effect on sucralose, with it being present at moderate levels in effluent water. Of course, as I said above, not all organochlorides are toxic as such. I’m certainly not saying that Splenda® is evil. Quite the contrary, it’s been found by repeated tests to be perfectly safe at the kind of levels involved in daily food consuption***. Though, knowing how chlorocarbons have caused environmental issues in the past, I can’t help but hope that the scientists involved in manufacturing the stuff know exactly what they’re unleashing on the world. Personally, I’ll be sticking to natural sugars. If nothing else, in my humble opinion, they taste nicer. *On that note, I don’t take too well to being herded either. **I say ‘still available’. Several have been taken off the market after being found to break down into toxic fragments. Which is still better than in ancient times — the less said about sugar of lead the better! ***It’s worth noting though, that not much data exists regarding higher levels of sucralose, and those data that do exist don’t look good. But then, almost anything is toxic at a sufficiently high dosage. This entry was posted in chemistry, Imported from Livejournal, molecular gastronomy and tagged molecules. Bookmark the permalink. 22 Responses to Chlorinated sugar…?